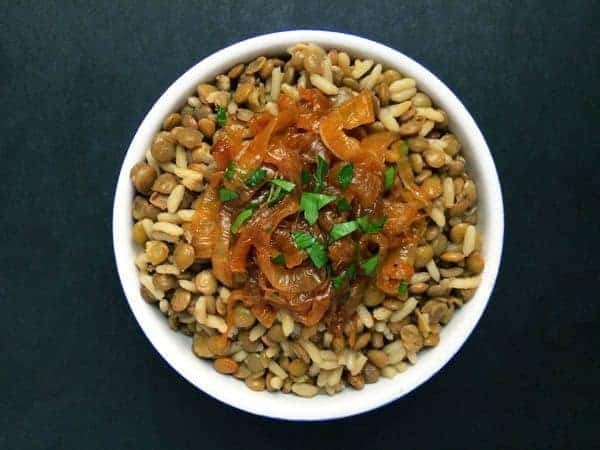 A protein-packed side dish or vegetarian main, this humble dish of lentils and rice is topped with addictively delicious caramelized onions. Isn’t it funny how the most simple and basic foods are the often ones we crave most regularly? 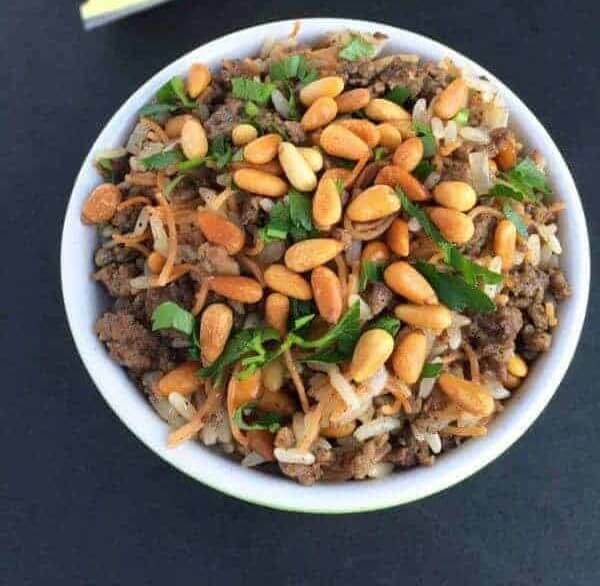 M’Juddarah, a Lebanese side dish, is exactly that: nothing more than a humble yet satisfying bowl of lentils and rice topped with caramelized onions and maybe a dollop or two of plain yogurt. You can serve it warm, room temperature or cold out of the refrigerator. M’Juddarah was a staple in my Great Aunt Vieve’s house throughout her entire 90+ years of life. She and her husband Mose owned four furniture stores in Terra Haute, Indiana where she also worked as a secretary when she wasn’t home making multi-course Middle Eastern feasts for friends and family. 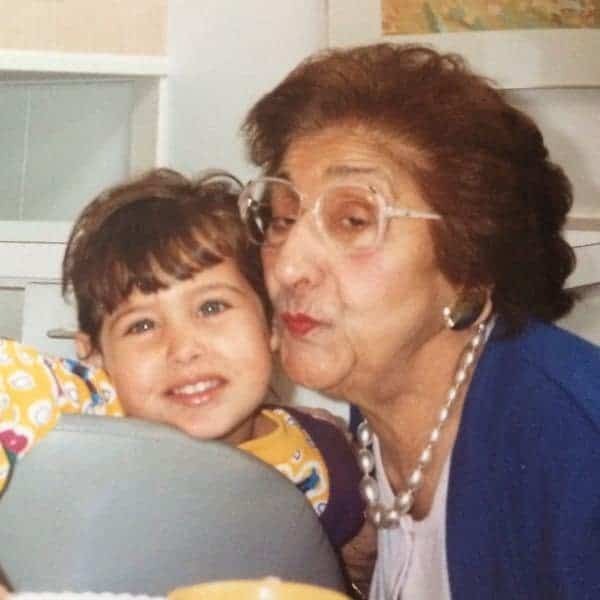 Aunt Vieve, pictured above with my little sister Anne circa 1993, not only taught me how to make the perfect platter of hummus but she also gave me the gift of learning how to properly dress a Lebanese salad. 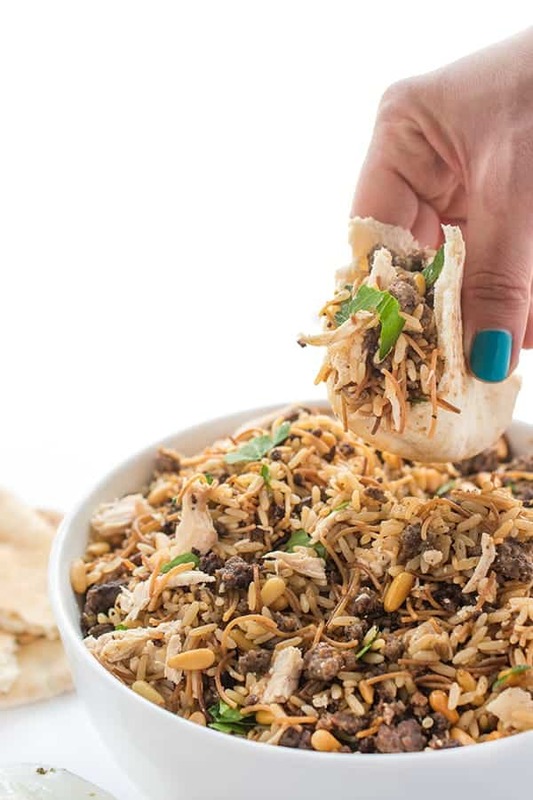 In addition to keeping M’Juddarah on hand in her refrigerator to serve with dinner any night of the week, Aunt Vieve would often include it as one of the several homemade, from scratch Lebanese meals she prepared and delivered lovingly to her husband every day at work. In other words, I want to be Aunt Vieve when I grow up. Heat oil in a deep sauce pot over medium heat and sauté onions until translucent and caramelized, 20-25 minutes, stirring frequently. Sprinkle with salt and pepper to taste. Remove from pan and set aside. In the same pan, add lentils and increase heat to medium-high. Toast lentils for 60 seconds then add 6 cups water. Bring pot to a boil then reduce heat to low and simmer until lentils are halfway cooked, about 15 minutes. Add rice, salt and pepper to the pot and bring mixture to a boil. Stir once, cover with lid, then reduce heat to low. Cook until all liquid is absorbed, about 15 minutes. Fluff lentils and rice with a fork before serving with caramelized onions. Serve with plain yogurt or Lebanese Cucumber Laban if you wish. 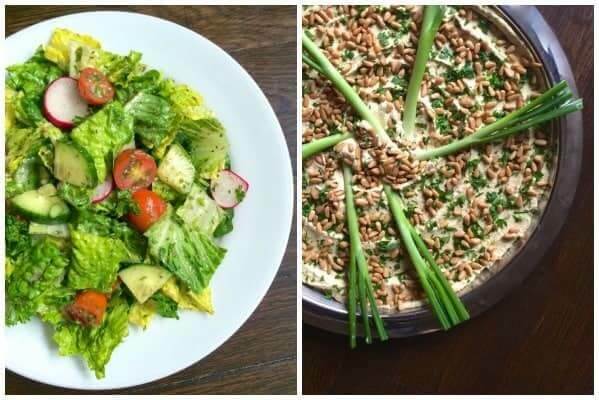 For more Lebanese recipes, check out my Pinterest board! I like to know how much in grams do you mean when you say serving . I’m afraid I don’t know sorry! I loved that was easy to make. My problem was it was very bland. The restaurants I get it from its has some kick to it. I work in DEARBORN MICHIGAN so I eat this dish a lot. Did you add the caramelized onions on top? That’s where most of the flavor comes from. :) This is how my family makes it so we don’t add spices like cumin but you’re welcome to! I was sitting here chowing down on a bowl of majudra with laban and lube ib tume (gotta have with majudra) and was trying to find recipes that are similar to the way I was taught to make it (way back in the mid ’80’s). I was taught to use bulgur wheat instead of rice. Bob’s Red Mill (only a couple miles from my home) only carries golden bulgur now, and it really adds a lovely, sweet nuttiness. I’ve adapted the recipe to include a little pearl barley – awesome result. And I caramelize 3-4 lbs of onions and mix it all in. NOW I’m gonna deep fry some of them for the top! But the stuff that make majudra sing is lube ib tume! It’s just cooked green beans with garlic, salt, lemon juice and olive oil. There’s a trick to getting it right, but when you get the right amount of salt… heaven! I was taught to mash the garlic-about 3 cloves with 1/4 tsp salt (I use a mortar and pestle) into a nice smooth paste, then spread it all over the inside of the bowl you’re going to mix it in. Then you put your 2 lbs of cooked green beans in the bowl, add 1/4c. fresh lemon juice and 1/4 c. olive oil (mix it up good before adding to bowl) then toss the green beans with all the good stuff in the bowl. Now you taste… if not enough salt, add a little at a time until it… SINGS. You’ll know when that is – it just “comes alive”. Uncle Dave Kahl called majudra, “Syrian soul-food”. Now that I’ve found your site, I get to add some new things to my repertoire! I just started my first attempt at preserved lemons… Thank you for sharing with us! Oh my gosh thank you SO much!! I’m going to share your comment with my aunts. I can’t WAIT to try making those green beans!!! Thank you so much!! I love when you post your family recipes. My mom used to make this; it was one of her favorites. Love the pic of your aunt! I figured out part of the problem – the type of lentils seems to really make a difference. I made a different lentil dish tonight, one that I’ve made dozens of times, using a lentil I’ve never used before – small green lentils I bought at a Middle Eastern grocery store. Well, I had to boil/simmer them for at least 40 minutes before they were soft, and even with continued cooking they never got mushy. The old type of lentils I always used start to fall apart after boiling for 12 minutes. They were just brown or green ones in the bags at the regular grocery store in the rice/bean section. Can’t wait to try your recipe again with the new kind! Yes those are much faster cooking than the traditional brown! Good luck! Just made this, the flavor was absolutely AWESOME!!!!! The texture, however, had the same problem I’ve had when I’ve made it using other recipes. I’m an experienced cook, and was afraid to use the full 6 cups of water (based on what happened the other times I’ve tried this!) so I only used 4 cups. It still turned out to have a “shaggy” texture, and everything would have easily mashed together if I hadn’t been careful when stirring at the end. The lentils did not keep their shape. I used generic lentils from the grocery store, I don’t know if they were considered green or brown or if this makes a difference. My attempt definitely didn’t look like the pictures above! Any tips would be great! Flavor was awesome, though, I will make it again! Hi Jen – Something didn’t go right because I’ve made this endless times and the lentils are never mushy. If anything they are firm to the bite. You’ll always want to use regular lentils (not red or black) but it sounds like you did that. Did you measure the lentils and water correctly? I honestly can’t think of what you did wrong but it’s never ever mushy! Thanks for your reply! I tried some different variations of this just to see what would happen, and I definitely think that I boiled the lentils too vigorously in the beginning, so that they were already almost overcooked by the time I added the rice. Next time I’m going to have the water barely simmering while the lentils are cooking by themselves. Still kind of scared to try the full six cups water though! That’s a 3:1 ratio of water/solids! Was looking at your other recipes and found one where you used 4 cups water and 2 cups lentils/rice…… Love your website – I made the cucumber laban and it was AMAZING! I’m glad to hear this!!!! Thank you!!! Can’t wait to try it again. Do you agree with simmering the lentils very very gently in the beginning, as opposed to boiling vigorously? Because as I said, I only used 4 cups water (with 1 c rice and 1 c lentils) so it shouldn’t have been that mushy…. how hard do you boil yours? Well you’re almost doubling the lentils this time. I boil them at a normal medium-high amount I would say! Use brown lentils, soak for 2 hours, boil for 20 minutes, then drain but keep the water. Add lentils to equal amount of soaked rice (rice should have been soaked for at least an hour), add a heaped teaspoon of cumin, some pepper & 2 teaspoons of salt, return the lentil water saved but only use enough to cover the rice & lentils – this would normally be about 1 and half cups – depending on the amount of lentils and rice. Boil until water seems to have evaporated, uncover, add caramelized onions and the hot oil they’re in – needs quite a bit of oil – mix well, and cover. Leave to cook further in the steam with a very low heat for 5 minutes, then turn off the heat completely and leave covered for another 5 minutes before serving. Your version sounds delicious!! In Syria our family doesn’t add cumin but I love the idea of it! Can’t wait to try this – I’ve tried to make it using other recipes in the past, and it came out totally mushy and almost inedible. I know how good it is when it turns out well – it’s the best! Six cups of water sounds like a lot – does a lot of it boil off while cooking the lentils uncovered? Wonderful recipe, eaten with yogourt this dish to die for. Liz, thank you for such a delicious recipe! Made this for dinner a couple of nights ago andit was simply off the charts! Forget portion control on this dish…..just run an hour longer. It is totally worth it. Love the beautiful story and pictures that you wrap around the recipe as well. I totally agree with you – it’s absolutely worth it! Thank you for your nice words – I appreciate it!! Love the combo, Liz. I’ve been cooking a lot with lentils recently. Did you know you can make caramelized onions in the crockpot? I just made a big batch. Slice onions, sprinkle with a little olive oil, and cook on high for about 8 hours. The recipe, which I saved ages ago, uses six cups of onions to two tablespoons olive oil. You can freeze leftovers for use later. No standing over the stove trying not to burn the onions! Yes I did!!! I also know you can do them in the oven!!! Such a time saver!!!! This is one of those rare meals that’s all beige, but still SO good for you. I can totally see it being comfort food! oh my gosh YES!! Such a good point! Hi Liz ! I don’t post much, but I love your blog! (Read it every day!!) I love your stories. Love your pics, family & recipes!! Every one is a winner!! You are an inspiration. I Have 2 grown kids & 2 granddaughters. I wish I had blogs like yours 30 years ago when I was raising my kids!! I cringe when I think back to those days of Kraft Mac & cheese and frozen chicken fingers. Despite that, my kids are wonderful. My daughter does BLF w her 2 & grandma now shops at TJs, Whole Foods & cooks healthy dishes like your recipes!!! Thank you so much !! I love lentils & def trying M’Juddarah. 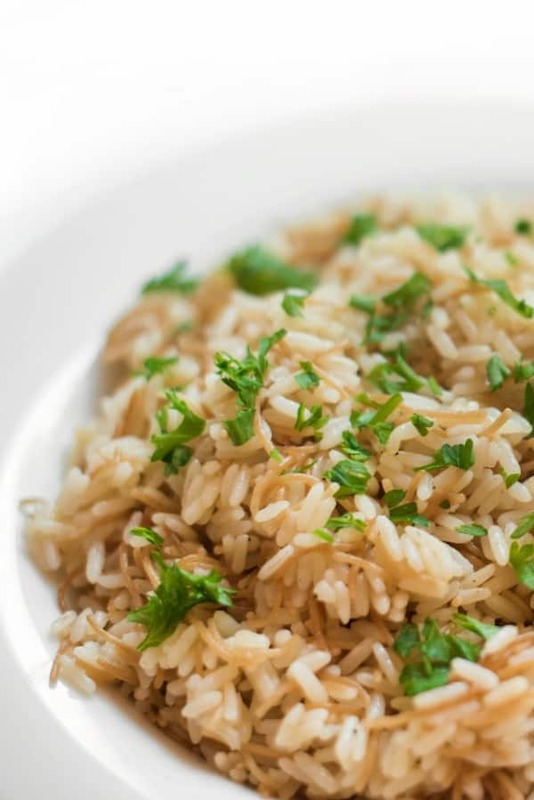 Is it sacrilege to use brown rice? I don’t have white in the house but can always get some. No not at all! We use brown rice and also bulgur wheat instead of the white rice. Thank you so much for your sweet comment Bonnie – it really made my day! I love family stories like this! I can’t wait to try this. I love all the ingredients separately and have no doubt that together they are that much better! This looks delicious! I LOVE the picture of your Aunt Vieve! So simple and delish. :) Thanks Emma! I know I’m always trying to make more lentils too! Thanks girl! My mom used to make this. It was one of her favorites. Thanks for the memories. I love to hear that Ani! Thanks for being here Liz! I may have said this before, but I love that you post Lebanese recipes. I had a Lebanese boyfriend in the distant past, who taught me how to make hummus (and introduced me to pita bread, tahini and string cheese). So the Lebanese version is my gold standard for hummus, and besides that, the food is very tasty. This dish sounds absolutely wonderful, so I’m adding it to my long list of recipes to try. Oh I’m so glad you enjoy the Lebanese recipes. I love sharing my family stories! I just had M’Juddarah last night, what a coincidence! I love finding other Middle Eastern bloggers who post recipes that are such classics. Are you Lebanese as well? No way you did?? Small world! I am technically Syrian but really I’m 4th generation American. :) But yes we love and eat Syrian/Lebanese food all the time! That’s so funny!!!! I hope you try it again! The stories you have are just as wonderful as your recipes! Aww thank you so much Gaby!! This is one of my favorite middle eastern dishes – I especially love when the onions are charred a bit. Love how your family has such a colorful food history! YES!! My Aunt actually deep fries them. ;) Thank you so much friend! I want to be Aunt Vieve when I grow up too. hahah I want to be her too!! Isn’t she so cute? I’m so jealous that you found good m’juddarah!! I’ve tried it in many restaurants and it’s always overly cooked and mushy. The lentils should have a bit of a bite to them still and the rice shouldn’t be too puffy. And yes, they definitely deep fry the onions. :) My Aunt French fries them and they are to die for!! It sounds as though your great aunt was an amazing woman! And this looks like the perfect bowl of comfort food. Everything is better with caramelized onions! Totally making!!!! Lentils and rice are my jam! I LOVE the story behind this recipe almost as much as the recipe itself. I was actually thinking I needed to eat more lentils, like, TODAY….how did you know!? Oh I love this so much! And I love that pic of your Aunt!! What a great recipe, and I can see why you would crave it. I am craving it right now!